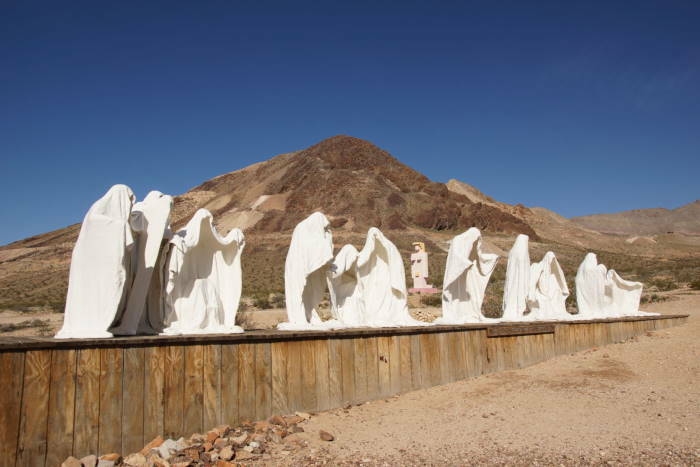 What’s the deal with that line of ghostly figures standing in the middle of the desert? What about that blocky woman with the noticeable, um, blonde hair? 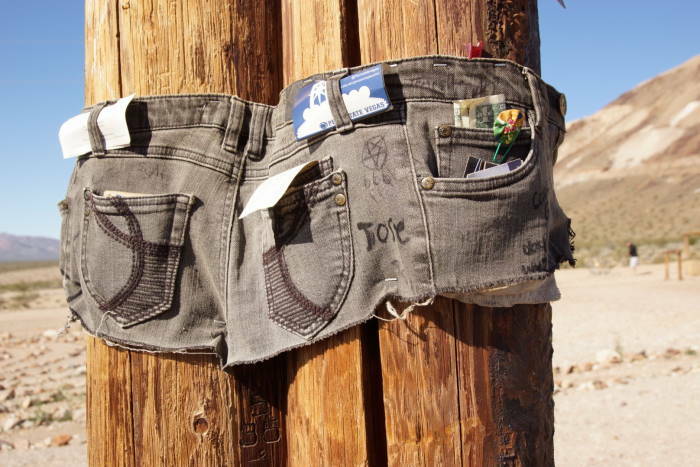 A visit to Rhyolite Ghost Town, just outside of Death Valley, often raises these questions, and it’s all because of the Goldwell Open-air Museum — a collection of unusual outdoor artwork, just outside the ghost town. Rhyolite is located west of Beatty, Nevada, and east of the entrance to Death Valley National Park, along Nevada Highway 374. From Beatty, you’ll cross over a small hill and into a valley. As you reach the valley floor, watch for a dirt road on the right side of the road. Rhyolite and the Goldwell Open-air Museum are just a short drive up the dirt road (passable by all vehicles). So, what’s the deal with that row of ghosts? This is the The Last Supper, the Goldwell Museum’s first sculpture, and it’s been here since 1984. Polish Artist Charles Szukalski chose the Mojave Desert because it resembled the Holy Land, and it was about as far away from Europe as he could get. He used models draped in plaster to create the ghosts (basing their poses on Da Vinci’s famous painting). When the plaster dried, the models stepped out, and Szukalski coated the figures with fiberglass. He hoped they would survive for two years, but they’ve lasted more than 30. 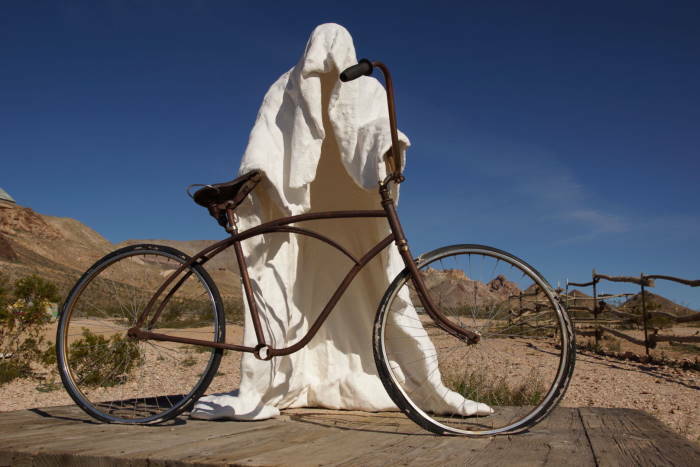 Another sculpture from 1984, called Ghost Rider, has also survived. A third one was destroyed. If the ghosts aren’t eye-catching enough, how about a two-story-tall pixelated naked lady on her knees? 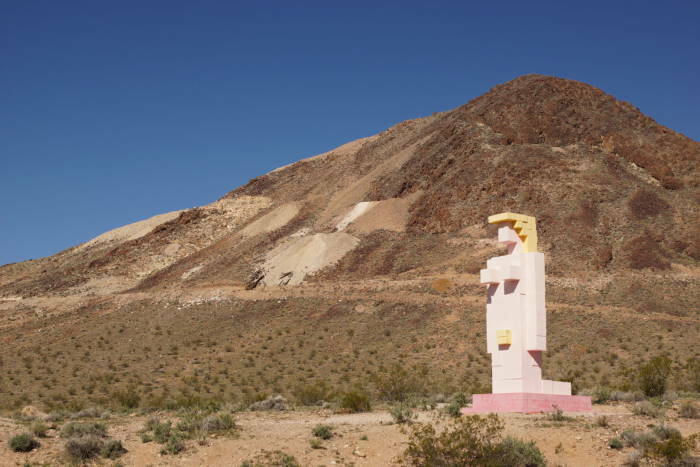 Lady Desert: The Venus of Nevada was added to the museum’s collection in 1992. Artist Dr. Hugo Heyrman believed the sculpture bridged the gap between Greek art and 21st century technology. And then there’s the perfectly logical combination of a gold miner and a penguin. 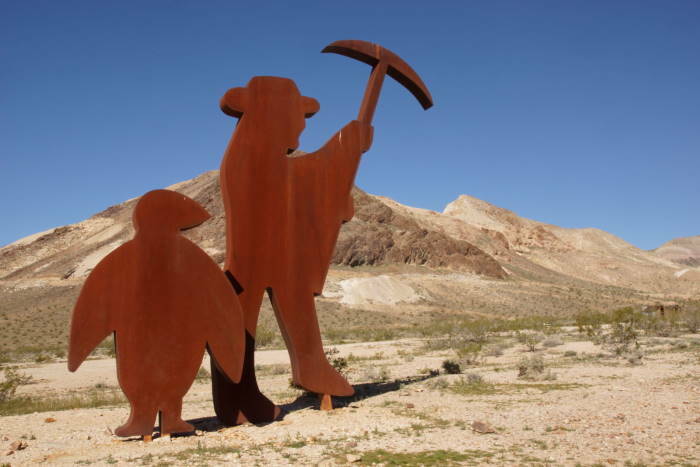 Tribute to Shorty Harris depicts one of Death Valley’s most famous prospectors (I visited his grave on the West Side Road, later in the trip). The penguin likely expressed how artist Fred Bervoets felt out of place in the desert. 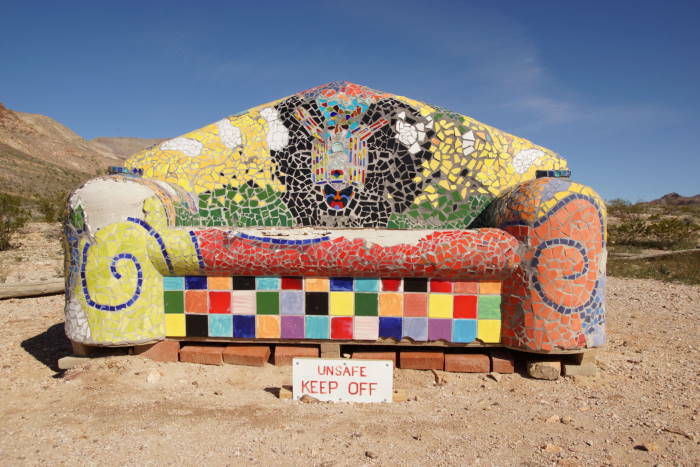 There are a few other pieces of art on the grounds of the museum, including this couch called Sit Here, which ironically is positioned behind a “keep off” sign. There is a small building in the middle of the museum grounds, but during my visit, it was closed and locked. I’d imagine that its opening hours are somewhat hit-and-miss. But that’s okay, because you’re allowed to walk around the outdoor museum anytime, day or night. Before you go, slip your business card into the back pocket of these pants. You won’t need to spend a lot of time in Rhyolite and at the Goldwell Open-air Museum, but both offer some great photo opportunities. You should probably plan to spend an hour or two, on your way into Death Valley for the day.